Catalogue descriptions cannot always fully describe the breadth of contents within collection items, especially with administrative records which can contain a multitude of facts and figures. This week’s blog presents the Edinburgh District Board of Control Report, 1914-1923 (LHB44/3/10), part of the Bangour Village Hospital collection, which contains a fine collection of photographs printed on good quality paper bound into the volume. These cover the period when the Hospital was used to treat soldiers from the First World War and include images of a soldier being stretchered off a train which has arrived at the Hospital’s own station, ambulances being loaded, and pictures of daily life for patients and staff. The main treatments shown are electro-therapeutics and orthopaedics and there are several images of many soldiers gathered in open spaces and in the Bangour shop, apparently in good spirits. The pages of the report are also twice the size of the previous volumes at approximately A4 size. It therefore serves to be both informative and an advertisement for the treatments used; a complete rehabilitation programme for those who often returned from the battlefields with broken bodies and minds. The two images selected for the blog are of a crowd of soldiers and nurses watching an open air concert, and of the orthopaedic curative workshops, where patients carried out tasks as part of their recuperation, such as woodwork to improve their dexterity. We’ve recently been awarded a grant from the Wellcome Trust’s Research Resources in Medical History (RRMH) programme to carry out a two-year project to catalogue patient case notes. This is exciting new work for us and, in fact, we don’t know of anyone else in the archive sector who has been cataloguing patient case notes in the kind of detail we will be. We aim to catalogue the four collections of Norman Dott’s case notes that we hold (approximately 26,600 dating from 1920 to 1960), and also produce a methodology that we can share with other archives that hold similar material. Norman Dott’s case notes hold an enormous amount of information that can help us understand how the diagnosis and treatment of neurological disorders developed during the twentieth century. Professor Norman Dott (1897-1973) had an international reputation in his field: early in his career he was awarded a Rockefeller Fellowship which enabled him to train in the United States under Harvey Cushing, father of modern neurosurgery. In 1924 he returned to Edinburgh and began a career in surgical neurology, holding posts at the Royal Infirmary of Edinburgh and the Royal Edinburgh Hospital for Sick Children, and in 1937 he established the Royal Infirmary’s new Surgical Neurology Unit. He was the pioneer of many new procedures, for example intracranial aneurysm surgery, and he often designed innovative equipment to assist him in his work. 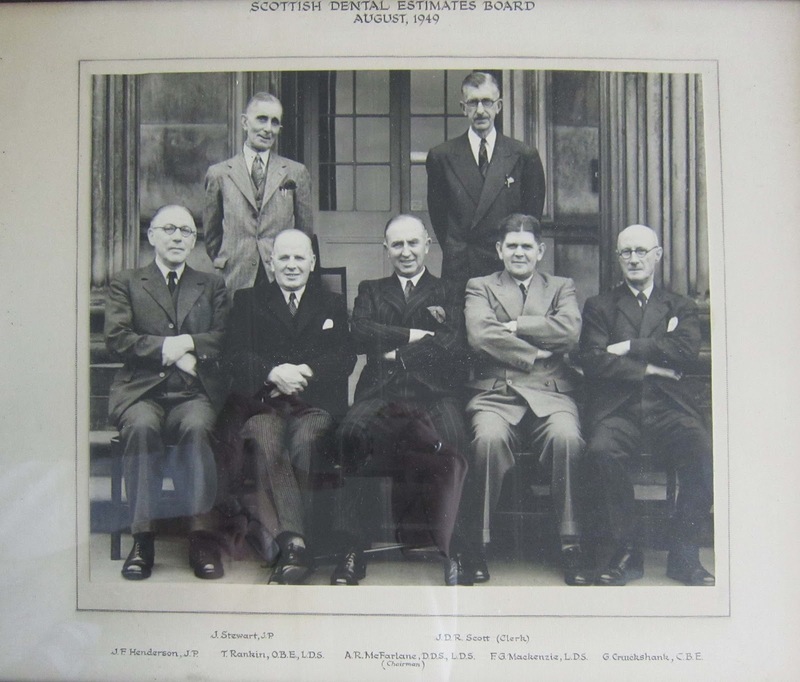 He founded the Brain Injuries Unit at Bangour Hospital, West Lothian, during World War II, and became the University of Edinburgh’s first Professor of Surgical Neurology in 1947. We recruited the Project Archivist last week and work will begin in early September – expect more blogs about the case note cataloguing once it gets underway! We’re delighted that the Wellcome Trust has agreed to fund this project, and thank them for their support. One of the most enjoyable aspects of being an archivist is opening up mysterious packages to discover historical items. As highlighted in a tweet last week, we recently received such an accession; two parcels packaged in newspaper, and covered in bubble wrap, about which we knew very little except that they contained photos from the Scottish Dental Estimates Board (SDEB). Closer inspection reveals that there are 10, framed, black and white photographs from the SDEB (now known as the Scottish Dental Practice Board) covering the period c.1949-1981. They are all formal shots, some showing the full Board, and others of individual members. As well as providing the identities of the SDEB members, photographs are always interesting because they provide a glimpse of earlier times and what may at first glance appear dull or of little value, can actually provide a wealth of historical information, ranging from fashions and technology, to hierarchy and gender relations. For example, of the six group shots from 1949 to 1970, none includes a female dentist and over that 21 year period, the standard dress code appears to have remained the same: a suit with waistcoat, and pocket handkerchief! This accession will fit well with our existing dentistry collections (for a full list, see our dentistry webpage), and also with related collections including the Public Health Department and the Blood Transfusion Service. Researching a recent enquiry has meant that some of the Royal Infirmary of Edinburgh Residency records were examined this week. The item photographed for the blog is a finely printed menu for the 19th Residents’ Club Annual Dinner, 1913 (our reference LHB1/117/6 (2)). After graduating, a medical student was required to serve a practical apprenticeship to finish off the training. To do this the graduate had to get an appointment as a House Officer at a hospital. During the 19th and 20th centuries, House Officers at the Royal Infirmary of Edinburgh lived on the premises and were known as the Residents. Some of their illustrious members have included Joseph Lister (pioneer in antiseptics) and Sir Robert Philip (founder of the first Tuberculosis dispensary). A great sense of camaraderie frequently existed amongst the Residents. They developed their own rules and codes of conduct within the Residency Mess and, occasionally, outrageous behaviour was recorded. Before 1950 the usual period of service was six months, and before 1948 this was unsalaried. On serving their time as Residents, the former students could start their careers as professional doctors, but to keep alive the friendships made in the Mess, they joined the Old Residents’ Club, formed in 1895. The menu features a portrait of Sir George Thomas Beatson, Society President, on the cover and plates of the Royal Infirmary of 1741-1879 as designed by William Adam and the Royal Infirmary as it was on Lauriston Place until the move to Little France in 2003. The menu (which is in French) includes cold Norwegian salmon, chicken braised George the Fifth style, and strawberries and cream.